In my recent blog on the ocean warming and the large black marlin caught off the coast at Mallacoota I quoted at length from the Skeptical Science website on how thermal inertia works. Skeptical Science used the analogy of a boiling a pot of water on the stove. 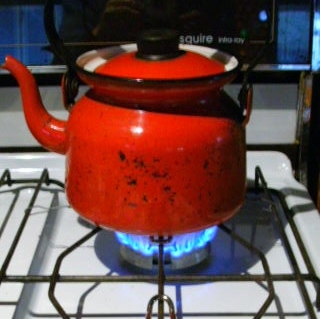 Even though there is an enormous amount of heat under the pot and a relatively small amount of water in it there is still a delay of some minutes before the water boils. In the real world we have the opposite occurring. We have a human enhanced greenhouse effect warming the planet – gradually in human time but almost instantaneous in geological time. And this increased temperature is acting on the vast oceans of the planet. Extra energy of the equivalent of four Hiroshima atom bombs per second is being added to our atmosphere and more than 90% of this heat is absorbed by the oceans. Even so the delay in the warming of the oceans is measured in decades and of which the 40 year delay is the mid-point of the scientific estimates of this extremely difficult calculation. Factoring in the thermal inertia of the oceans has a number of consequences. One being that if we could somehow stop all greenhouse gas emissions instantly the warming would continue for 40 years and possibly a lot longer. But perhaps the big message is that mankind has already caused much more warming than we can possibly imagine. The warming of our oceans, the one degree temperature rise over the century, the ‘Black Saturdays’, the ‘Millennial Drought’, the heat waves, the record black marlin at Mallacoota and Bass Strait, are all just the start of bigger (and worse) things to come. As I pointed out the amount of CO2 in our atmosphere in 1980 was 340 parts per million (ppm) whereas now it is over 410. If we assume the pre-industrial level was 280ppm then the additional 60ppm to 1980 has caused at least the one degree of temperature rise we are now experiencing and probably more. We note that in the last 40 years we have added a further 70ppm indicating that possibly a further degree of warming is already in the pipeline. Finally we can add the one or two ppm we are continuing to add to the atmosphere each year. Even these very rough layman’s calculations indicate that keeping temperatures below the generally accepted safe level of two degrees is looking impossible. Whether it is a dry that never seems to end, a bushfire that consumes everything in its path to the big break (Bass Strait) a heatwave that hits 45 degrees each day for a week causing a rush of fatalities overwhelming our hospitals and running blackouts across the power system or regular flooding of Lake Entrance and coastal villages this will be the sign that the climate emergency has started in earnest.